Oklahoma City, OK March 9, 2017 – TSS Photography was recently named to the 2017 Top Franchises for Women by Franchise Business Review. 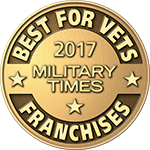 SPRINGFIELD, VA, November 15, 2016 – Military Times recently announced its Best for Vets: Franchises 2017 rankings. Selection focuses on financial discounts and corporate policies related to vets. TSS Photography was recently named a top franchise by Franchise Business Review in its 2016 Top Low-Cost Franchises Report. Oklahoma City, OK, November 10, 2016 – TSS Photography was recently named a top franchise by Franchise Business Review in its 2016 Top 50 Franchisee Satisfaction List. TSS Photography was recently named a top franchise by Franchise Business Review in it’s Guide to Top Child and Senior Services Franchises. SPRINGFIELD, VA – Military Times today announced its Best for Vets: Franchises 2016 rankings.